Open System Consultants, the maker of the "Swiss Army knife of RADIUS Servers" and Finnish Internet architecture expertise company Arch Red have signed a joint agreement to strengthen their cooperation in providing expert services based on OSC's Radiator RADIUS server. Arch Red brings 8 years experience with Radiator, building RADIUS implementations for eduroam(tm) in Finland, its commercial application, the Wireless Tampere community network as well as for traditional Internet and mobile service providers. The new closer cooperation between Open System Consultants and Arch Red provides new opportunities for both expert services and product development, Arch Red managing Director, Karri Huhtanen says. Mike McCauley, OSC's managing director welcomes the synergies this new cooperation offers. With Arch Red's application experience, we can together provide the highest quality access solutions and technical support to our mutual customers. As a part of my postgraduate studies I attended a TUT seminar course about cloud computing and chose to do my presentation about the cloud computing business models. Obviously this only covers only small part of them, but the presentation gives a general idea about what models are available and on what level of cloud computing solutions (IaaS, PaaS, SaaS etc.). View more presentations from khuhtanen. Feel free to comment or ask questions about the presentation and I will try to answer them in the comments. What is eduroam and roaming? For you, it is possible to get this technology to your home organisation or even a company by utilising Arch Red products and services to bring your network and users as a part of eduroam or other community networks such as Wireless Tampere (Langaton Tampere). A mobile Wi-Fi access point is a very useful way to both demonstrate and extend existing community network coverage over any third-party broadband connections. The problem usually is how the authentication traffic can be transferred over Internet jungle and secured from eavesdropping and man-in-the-middle attacks. Often this is done by deploying VPN solutions such as OpenVPN, but a new IETF draft, RadSec, makes it possible to achieve same security and functionality without having to rely on the use of VPNs. It has been in my plans to write this article for a while now, but now finally Easter holidays gave the opportunity to finalise the configuration and some free time to write these configuration instructions. This blog post describes how you can build a mobile eduroam access point by utilising RadSec and a popular open source access point firmware called OpenWRT. The network architecture is presented in the Figure 1 above and the rest of the instructions follow below. The first thing to do is of course install OpenWRT on your access point. There are several different OpenWRT supported access point models and the installation instruction vary between models and manufacturers. In this case I assume that you have alredy OpenWRT based access point installed and continue from the actual eduroam and RadSec configuration. The base OpenWRT distribution does not come with all the software we will require so we need a working Internet connection to install some additional packages. The most important of these are the tools for time synchronisation (for certificate validity verification) and radsecproxy for RadSec functionality. The wireless settings for eduroam are configured in /etc/config/wireless. The important thing to notice is that the RADIUS server (radsecproxy) will be run on the OpenWRT access point. Radsecproxy is an open source implementation of the RadSec protocol. The RadSec protocol is essentially TLS-secured RADIUS over TCP making it more reliable and more secure for setting up connections over unreliable or unsecure networks (such as most Internet connections). # is the actual CA certifying both the server and mobile-ap certificates. I copied the necessary (CA and client) certificates manually to a directory /etc/certs I had created on the wireless access point file system. A larger deployment of RadSec access points would of course require either a scalable way to deploy and install client certificates or utilising only one client certificate for all mobile access points. Solving this issue can however be a topic for paper or some future blog post, when actual need arises. I did not yet configure the certificate revokation list (CRL) retrieval, but it is in my plans to document also this aspect. Then I rebooted the access point and verified once again that time was correct, radsecproxy was running as a daemon and wireless settings were correct before proceeding to eduroam authentication tests using my own TUT user account. Like you have probably guessed, the testing was successful and I was able to now have my own mobile eduroam access point to be deployed wherever I may roam. :) Of the difficulties I ran into while doing this, I think the most difficult was once again setupping and configuring the X.509 certificates properly. The radsecproxy default was to check if the certificate CN contained the IP address mentioned in the server block and I had to check from the documentation how this check could be replaced with hostname check without having to use DNS hostname in the configuration block. The result is documented above there in the radsecproxy configuration. 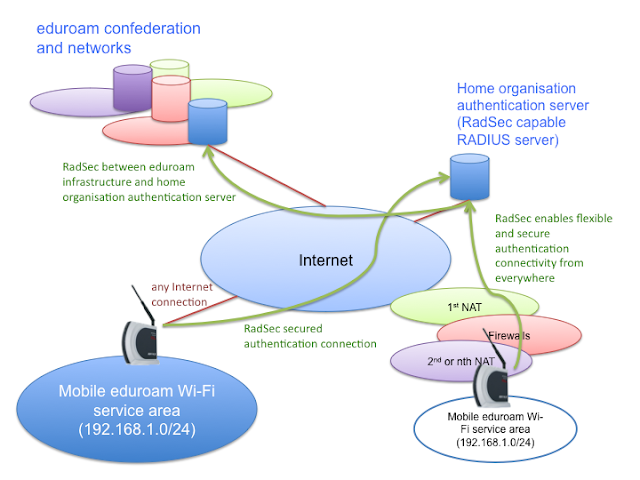 RadSec as a technology felt very solid and functional for connecting devices and services to eduroam and the radsecproxy open source implementation was so well implemented and documented that I think it could be used as an official open source implementation to join to the eduroam federation with RadSec and this way as a roaming proxy replacing for example FreeRADIUS. Even the current radsecproxy implementation has better functionality set (for example dead realm marking) for eduroam proxy usage than the current FreeRADIUS has. In one of the larger wireless campus networks there was a problem of an annoying host advertising 6to4 (2002) and fec0 prefixes to a network segment which already had an official IPv6 router. This is the same kind a situation as rogue DHCP server in IPv4 network. All traffic is sent to go through the advertising host and if that can either route or drop the traffic making IPv6 services slow or unusable. There exists few extensions for IPv6 to secure router advertisements and only accept proper ones, but those extensions are rarely implemented in the mobile devices. The IPv4 address corresponding to 2002:c0a8:2a3a::/48 prefix is thus 192.168.42.42. The IPv4 address is often enough to find the host and its owner, but in large wireless networks the IPv4 addresses may get reassigned so also the time of the problem must be recorded. Then the host and owner can be checked from the DHCP server logs or from the wireless network management system such as Airwave. RADIUS based authentication roaming federation eduroam(tm) expands in Japan according to Terena's translated news item. The expansion is done in cooperation between the Japanese National Institute of Informatics (NII) and Livedoor, a Japanese provider of commercial WLAN services. These kind of cooperation announcements give additional validation to Arch Red's vision on utilising eduroam(tm) tried technology to increase community network coverage through roaming instead of building overlapping Wi-Fi networks or trying to form only one dominating one. Karri Huhtanen is presenting ICT SHOK Future Internet Testbed, Wireless Tampere and Funet WLAN roaming today on 19th of February at TREX Workshop 2010.